I thought this would be a nice time to share a “mess-up” we had on the ranch. This particular cow and her calf have been a “mess-up” for the better part of 8 months. It’s important to share that, just like everyone else, we screw up. Since I quit my full-time, town job last spring my Parents have been generous with giving me cattle to sell. They do this so I have an income, and I appreciate it greatly. Right now I am finishing some steers to sell as beef, and in the past I’ve sold shares in “hamburger cows“. A ‘hamburger cow’ is a healthy cow that for some reason did not get bred and/or have a calf, so she is “open“. Since she is open, she isn’t doing her “job” for us, therefore she us costing us money. 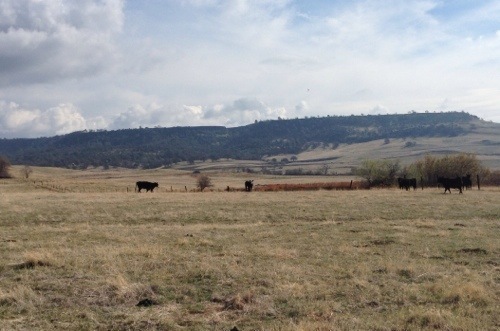 Most people don’t realize, but it takes years for a cow to become profitable for a ranch. 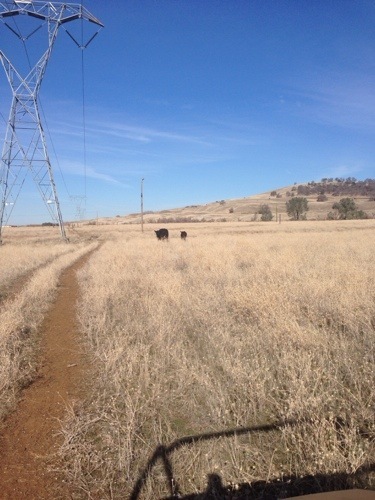 If enough cattle don’t do their ‘job’ and raise a calf, it could potentially cost a ranch a lot of money. As a cattleperson, it is one of your many jobs to make sure you don’t have many ‘open’ cows. Most cattlepeople will just “cull” a cow that is open. Depending on the year, it doesn’t make economical sense to keep a cow a whole year when she isn’t producing and she isn’t guaranteed to have a calf the next year. When we have open cows, I like to turn them into a hamburger cows if I can. It breaks my heart to see a big, healthy cow that we’ve had for a couple years go to the sale yard, even if she isn’t doing her job. Since I have many, many friends that are on the paleo diet right now, they want lean, grass-finished hamburger. Hamburger cows are exactly that – healthy, lean beef that has had nothing but grass and meadow hay to eat her whole life. By turning our cull cows into hamburger cows, everyone wins. My cow gets a quality death at home, my local paleo eaters get wonderful beef, and I get a paycheck. This brings me to my story…..
Last summer, my Parents gave me a hamburger cow in celebration of me quitting my job. I was excited about it because in my head I was thinking that I would use the money to buy myself a shinny new horse! This particular cow was fat, and she was open, we were sure of it! When we moved the other cows up to the mountains,we cut her back and she lived in a field next to the house for a few weeks, until I called and made THE APPOINTMENT. In the meantime, I’d found a group of people that wanted to buy her for a hamburger share. They were excited about having great burgers to grill all summer and I was already imagining that new horse smell. Right before I made the appointment, we noticed something one morning. A calf. My open, sold, cull cow had a bull calf! It was a problem on levels! I had to go back and explain to my hamburger cow buyers that I did not, in fact, have a cow for them. 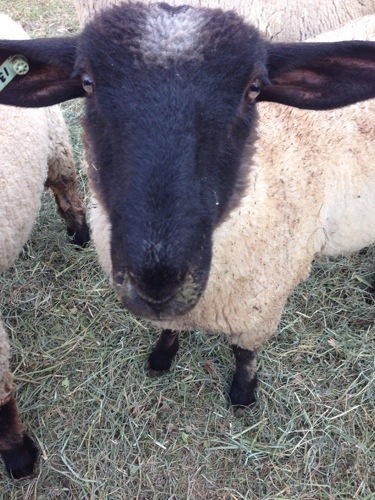 Then we had to worry about having a pair on the winter ranch, during the summer – the heat, stickers and predators are deadly. 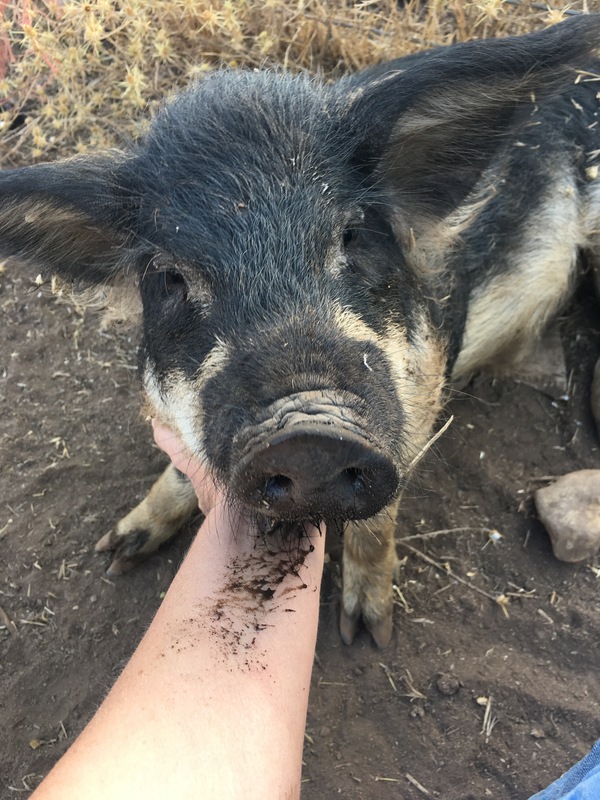 We figured we would need a replacement calf at some point during the summer, and we could use him (a replacement calf is when a cow needs a baby because for whatever reason her calf didn’t survive). Oddly enough this year ended up being the ‘year of twins’, he stayed with his Mom all summer. It took us all morning to find this little bull calf and get him in. Fast forward to now. This bull calf spent the past 6 months with little to no human interaction, he’s had no vaccinations, no brand, he still is ‘intact’ and he is wild! We felt especially tough last week and decided it was time to get this little bull calf in and in the words of my father “change his mind from @ss to grass” or castrate him. Since it was the year of the twins, we also had a house herd of bottle calves that needed to be vaccinated and branded. Last week was the perfect opportunity to tie up all of out loose ends, and “work” (work means to castrate, brand and vaccinate) these calves. The bottle calves on their way to the corrals. My Mom refused to help because she got too attached to them. We were able to work the bottle calves with no problem. They received their vaccinations and were de-wormed. They also got an earmark and a brand so if they got lost or stolen, we could identify them and bring them home. Next up, the Hamburger Cow’s bull calf. Since this calf has had no human interaction, he was scary to be around. If I would have given him the chance, he would have gladly jumped on top of me and done a little dance on my head. Don’t worry, I didn’t give him that chance! We dislike castrating calves when they are this old. We feel that the earlier it is done, the less stress is causes the calf. Unfortunately, because of the mess-ups we had with this cow and calf, we were left no choice. Luckily, he is a nice, healthy calf and he handled it well and is fine. There are several ways to work cattle. Some producers will use horses and rope their calves to work them, and some will use chutes. We feel like using a chute is less stressful for both our animals and us, so that is why we choose to use a chute and a corral systems instead of horses and ropes. Our calf table catches and squeezes the calves to keep them calm. 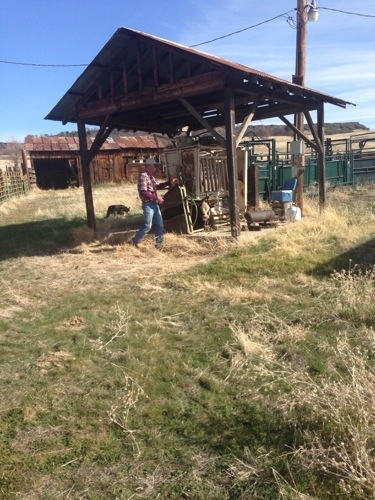 For the bull calves, we flip the chute/table on it’s side to preform the castration. The chute is built for this exact purpose, and it works well. HOWEVER, since our particular bull calf was a complete and udder mess-up, this didn’t work like it was supposed to. After our calf had been castrated and we tried to flip him back on his feet, but he just kept going. The calf table tipped the wrong way, WITH THE CALF STILL IN IT. I’d never seen that happen before, in all my years on the ranch. The mess-up. 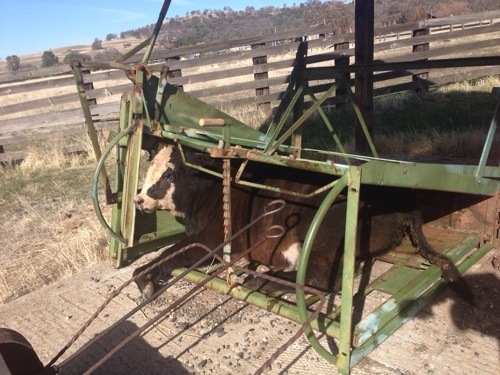 The calf table flipped over. The poor calf had to climb out. After it flipped, it took us a few minutes to get the calf out. But the calf was able to do it on his own, and was fine! Thankfully, the calf got out fine. He was let back out into the field with is Mom and has since recovered from his ordeal. I sincerely hope we are done with mess-ups with this pair! I check on my cow and calf today, and they are happy. Of course the calf wanted absolutely nothing to do with me, lol, poor guy, I can’t blame him! This has been our epic mess-up. Despite our best plans, sometimes nothing works out the way we planned. In animal agriculture I re-learn that lesson everyday. Animals always make life interesting! My last year of FFA (it says ‘got beef?’ on my steer). 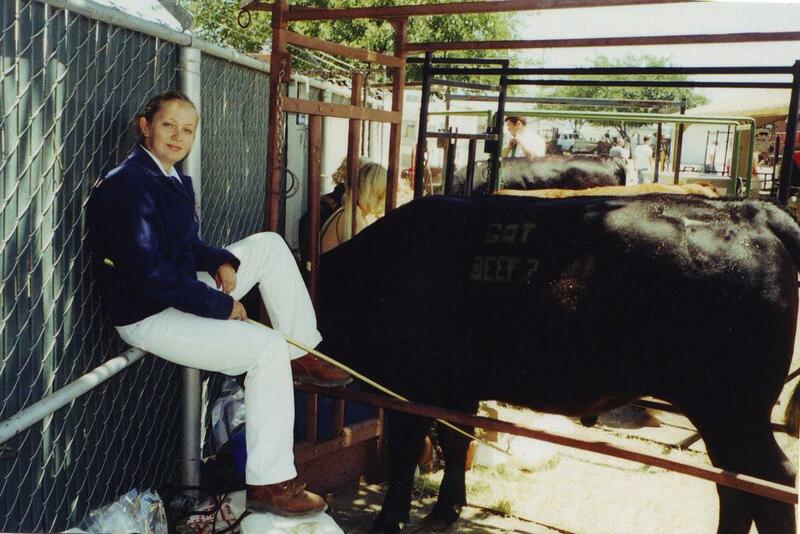 Back when I was a youth and heavily involved with 4-H and FFA, I raised market steers. It was a huge source of pride for me, that I would select, raise and show one of my own family’s steers. Our cattle are bred to be beef, not to win grand champion at cattle shows. Because of that I only won champion once in my whole 4-H and FFA career, HOWEVER I won or placed in the carcass contest (that is when the steer’s carcass is graded and judged) almost every year, and for a cattleperson, that values my final product, that meant tons more than a purple ribbon. My cattle weren’t always “fluffly” at the fair (that means they didn’t have a lot of hair for me to style), but I was confident whoever purchased my calf was going to get a prime piece of beef that they would remember for years to come. I still have this same level of confidence when it comes to our cattle. 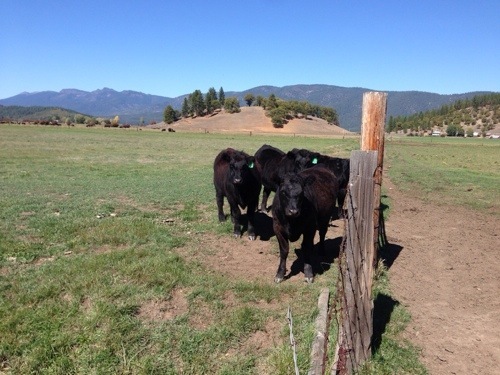 These are my steers leftover from our commercial herd this past August – they are a whisper over a year old here. You remember that I quit my full-time job in town last spring. 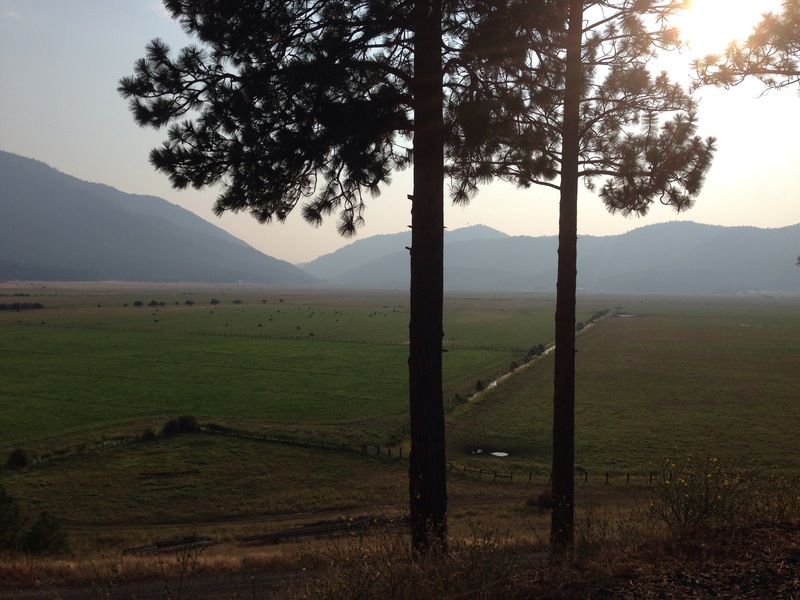 I am now living the dream on the ranch. Since I don’t have a steady income, my parents have graciously given me some steers to supplement my hog and sheep income. It has been a huge transition for me, to go from a salaried check every two weeks, to a couple of unknown checks a year. Budgeting is hard! These steers will be the majority of my income for the year – they will determine my quality of life, they will pay my bills. Because of this, because I know my current way of life depends on these animals, I want to do the best I can. 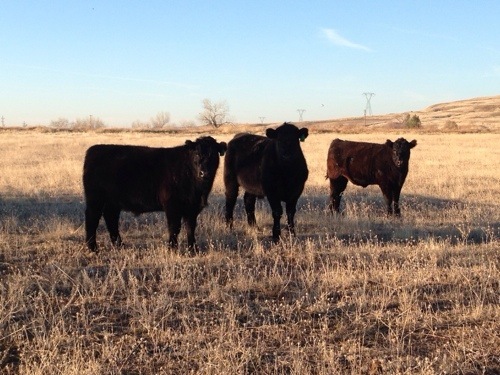 Since I have excellent herd genetics, I have access to grain, grass, protein minerals, hay and almond parts, my calves will be coming 24 months, and they are not stressed and are healthy, I know I can grow some great beef. I know it. 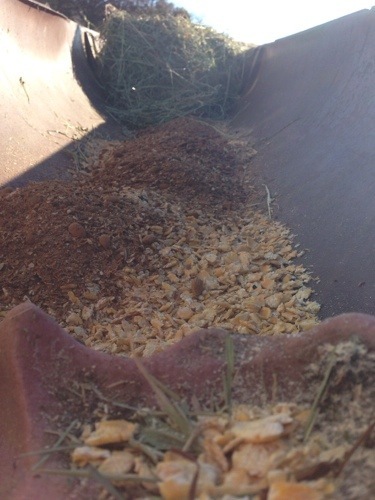 Good feed – this is rolled barley/corn, almonds and hulls, meadow hay (that we made), and a mineral block. 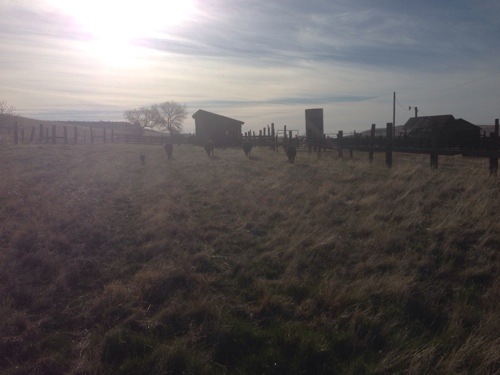 This week my Dad and I created a place for me to “finish” these steers. Since they already weigh around 1,150 pounds and are fairly fat, they will not take long to finish out. 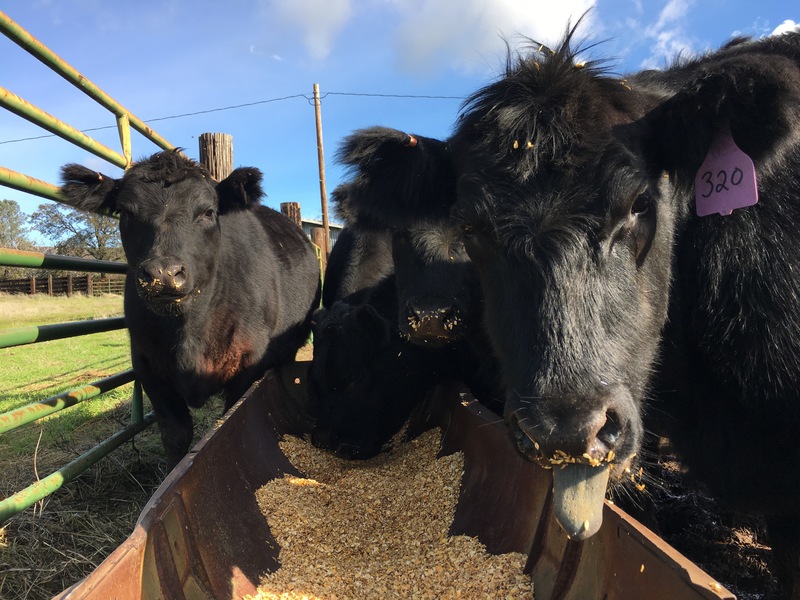 Basically by giving these steers grain, they will gain faster and the meat will taste less like grass and more like creamy, beefy deliciousness. If I had to guess, I will probably have them slaughtered around 1,400 pounds. 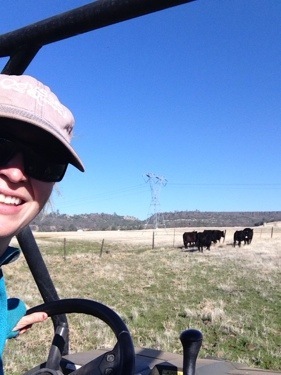 I took a felfie (a farmer ‘selfie’) while moving the steers into their new pasture. This is what the steers look like right now – it is going to be a blast watching them gain and finish. The only reason I am able to do grain finished steers this year is because the price of corn is low, so I can actually afford it, and the drought. 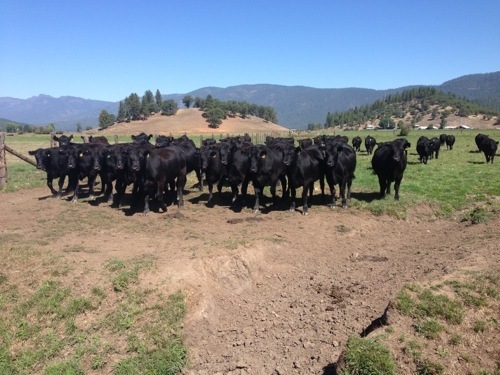 I have no grass to finish cattle on right now – so I either hauled these guys to the auction yard or I feed them grain, and I have too many people that wanted to buy local beef this year to auction yard them. 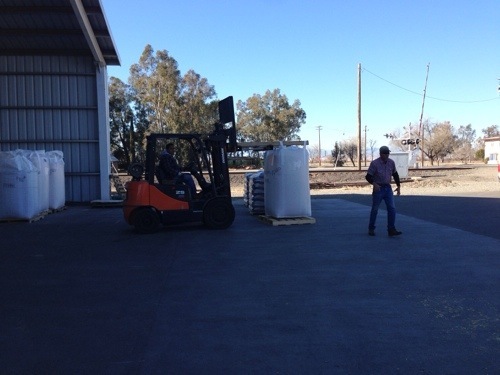 I’ve been after my Dad for a few years to let me finish some beef with grain, so this is actually exciting for me. The one thing I forgot to plan for was – I don’t get to keep one of these to eat. I am raising some of the best beef of my life and it’s already spoken for. 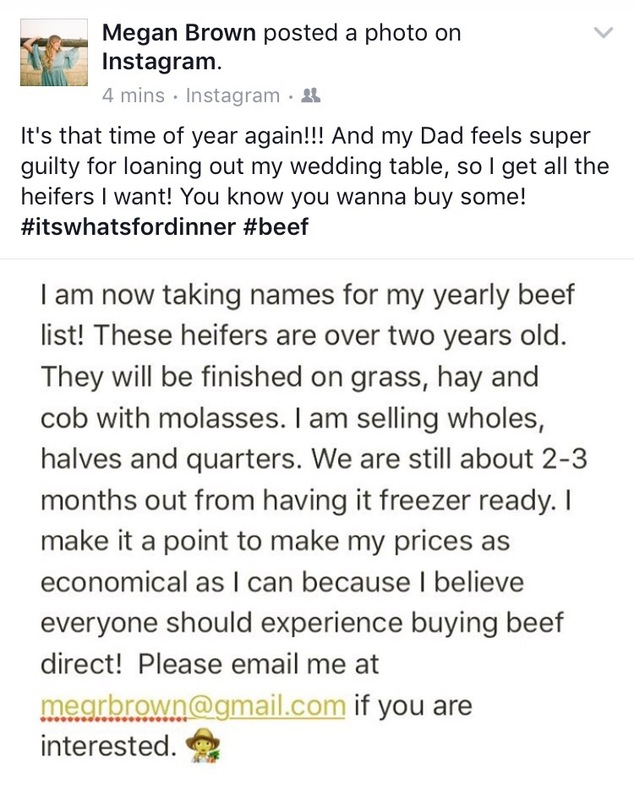 It’s my secret hope that this beef is so beautiful (and it will be), that my Dad decides that I need to do this again next year! Come back soon and I’ll let you know how they finished!